This book kept being recommended to me and now I can see why. As a huge extrovert I have become sensitive to introverts in my classes and meetings I run and always try to find ways to ensure they get time to speak. But The Quiet took my understanding to a whole new level. 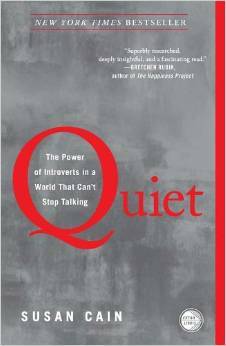 I love that the author takes a view that both extraverts and introverts are equal, we need both, but then demonstrates very persuasively that our society has become a nation that prefers the views of extroverts. She believes much of the reasoning behind the collapse of the technology boom was the result of most leaders of investors / entrepreneurs were strong E’s and they were not listening to the strong I’s who were looking at data (with little emotion) and not getting caught up in the tidal wave of thinking. Her examples ranged from the stock market and what she called the FUD thinking; Fear, Uncertainty, Doubt which is a conservative approach often embraced by I’s to Eleanor Roosevelt whose husband FDR was a HUGE extrovert and how Eleanor used her quiet style to influence much of his thinking. The push towards more teamwork in the workplace has been at the cost of individuals having time to think, be by themselves, and come up with deeper ideas. Cubicles are the nemesis of Introverts and deep thinking with all the distractions right in front of everyone. Even brainstorming is challenged in this book which surprised me! She provided evidence that more original ideas are generated from individuals working alone than in a brainstorming session with others. There is always an element of peer pressure in a group session and when people have time alone they can go to a “deeper” place and come up with even better ideas. Many of our greatest minds of all time were huge introverts but she argues we need these great minds as well as our great extroverts, it is just that we really need BOTH. A great “read” that I recommend to all. Introverts will relate and feel energized and us extroverts will actually slow down and appreciate our counter soul-mates better.